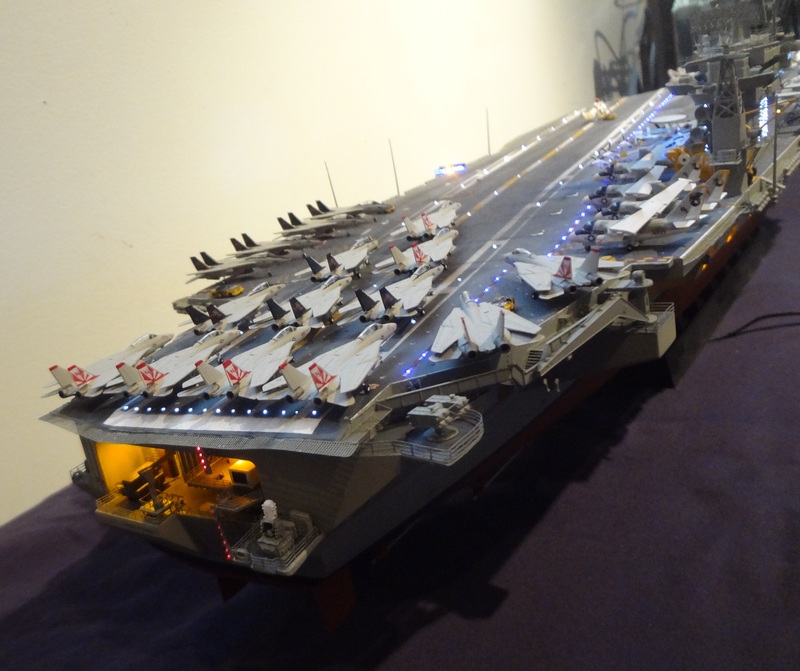 I started with the Nimitz model and converted it to the USS Carl Vinson CVN-70 as she was at the start of the 1983 world cruise (her maiden deployment). All differences as well as the hangar bay details were scratch built. I purchased extra aircraft sets to fill ship with all 86 aircraft. The decals for the hangar bay and aircraft were made by me. 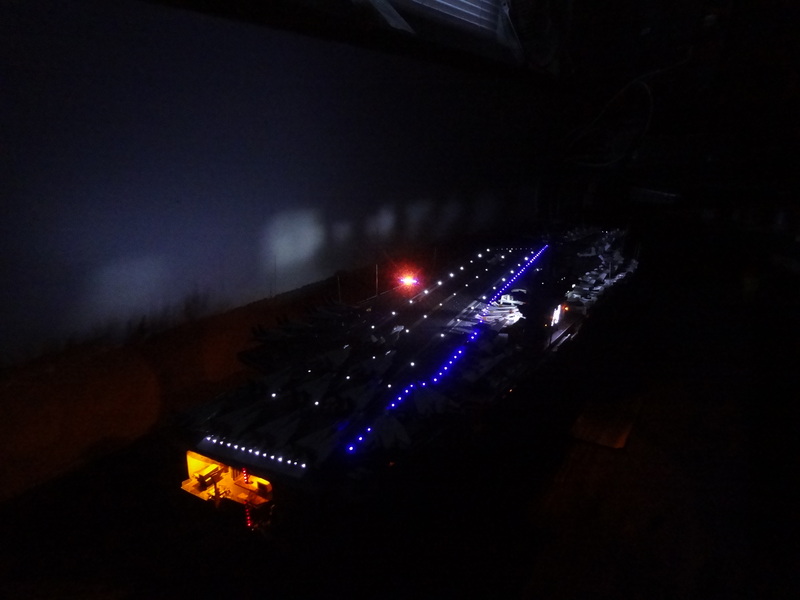 The ship is also illuminated with over 500 feet of fiber optic lines and 40 LED’s. Photoetch sets were used on the ship and for all the aircraft. 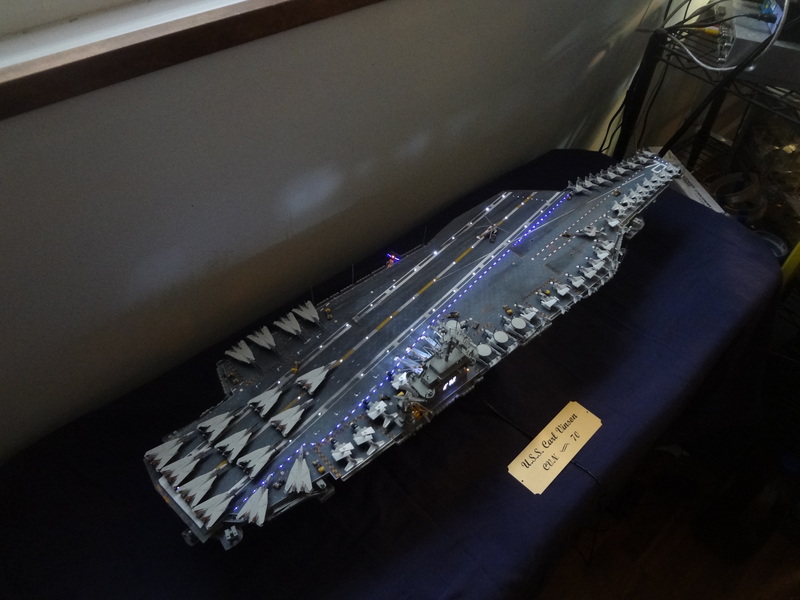 The ship is also accented with resin CIWS and deck tractors, 3-D printed hangar doorways and Tilly Crash tractor. Additional pictures can be found at the following locations. 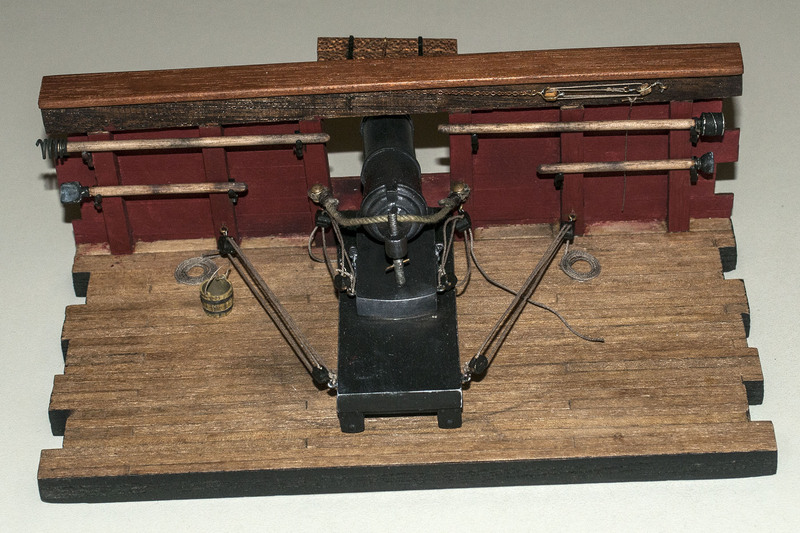 Marine Models USS Philadelphia 32 pounder Carronade. I won this kit (sight unseen) in an auction with a high bid of $20. 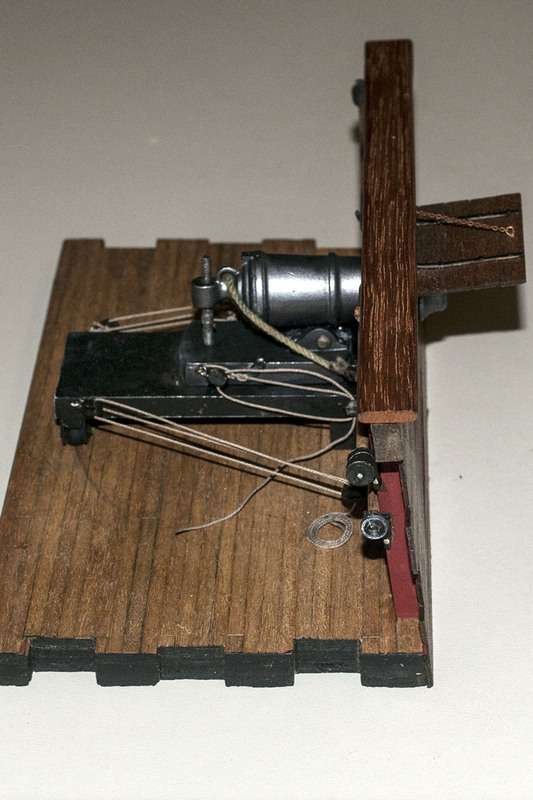 The kit is from 1947, a 70 year old unassembled wood and cast metal kit. 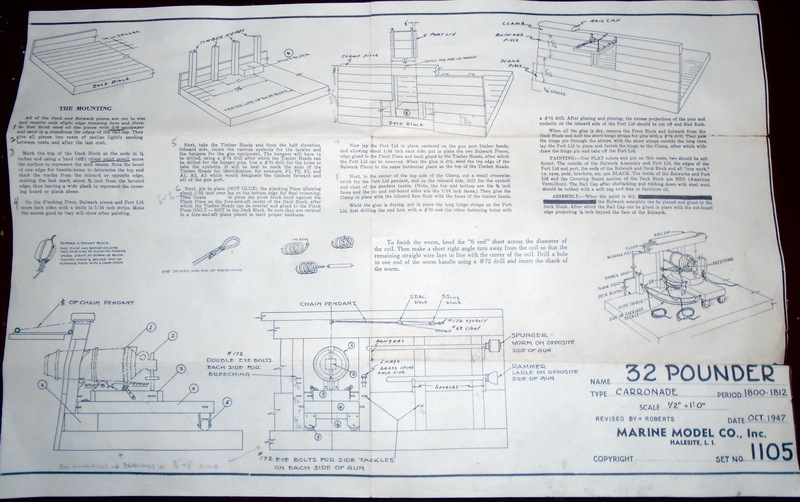 The base was a piece of plywood that the instructions said to draw lines to simulate deck planks. The bulwarks were were three pieces of mahogany which also were to have pencil lines to portray individual planks. 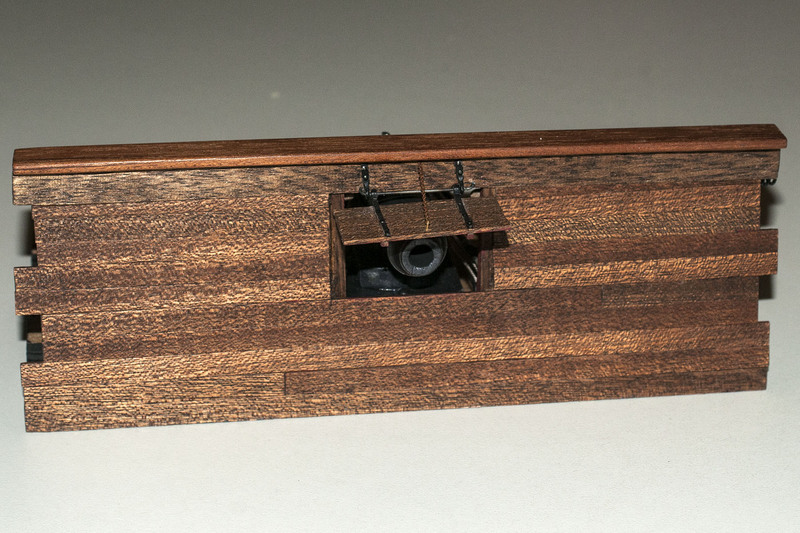 Knowing that this would not produce a quality representation of a deck section, I raided my scrap wood collection and found 5/32″ x 1/32″ basswood and some 3/8″ x 1/16″ mahogany and scratch built the deck and bulwarks. 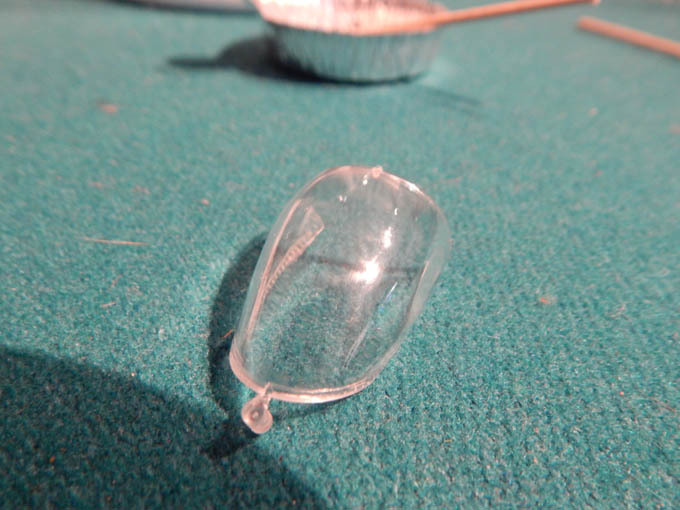 Two of the 8 cast metal pieces used for hanging the tools were broken, so I made a RTV silicone mold of two intact pieces and made cast resin duplicates with dye added to the resin to make them match the others. 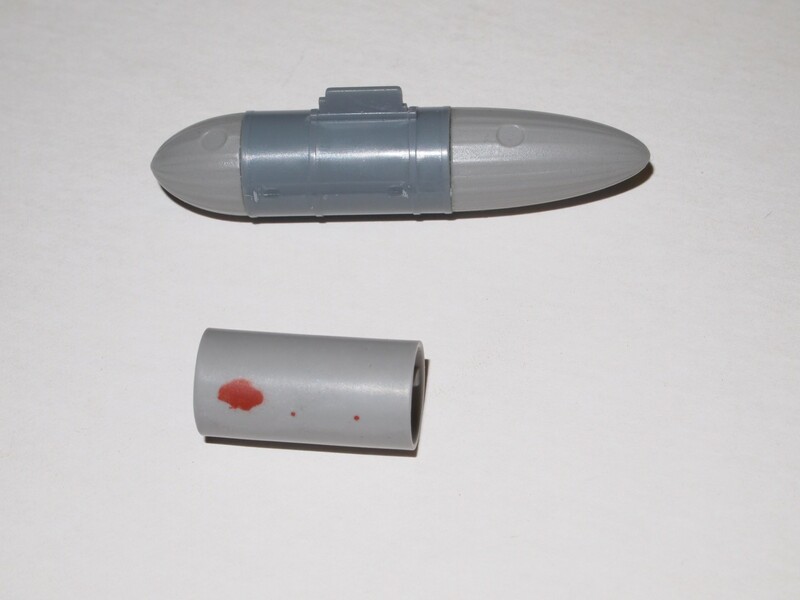 The cannon and its platform were epoxied together and painted with Tamiya gunmetal from a rattle can. All other metal parts were painted flat black. The inside bulwarks were painted a dark red custom mix of Testor Acryl paints and the deck and bulwarks were stained using Minwax Golden Oak & Red Mahogany. The scale ropes are from Syren Ship Model Company. The handrail has no finish other than being sanded down with progressively finer sandpaper from 1,500 to 12,000 grit, giving it a nicely polished look and feel. If you’d like, here is a brief history of what happened to the 2nd ship named USS Philadelphia (1799-1804). During the First Barbary War Philadelphia cruised off Tripoli until October 31, 1803, while giving chase and firing upon a pirate ship she ran aground on an uncharted reef two miles off Tripoli Harbor. The Captain, William Bainbridge, tried to refloat her, first laying the sails back, and casting off three bow anchors and shifting the guns rear-ward. But a strong wind and rising waves drove her further aground. Next they dumped many of her cannons, barrels of water, and other heavy articles overboard in order to make her lighter but this too failed. They then sawed off the foremast in one last desperate attempt to lighten her. All of these attempts failed and Bainbridge, in order not to resupply the pirates, ordered holes drilled in the ship’s bottom, gunpowder dampened, sheets set afire and all other weapons thrown overboard before surrendering. Her officers and men were made slaves of the Pasha (or Bashaw). Philadelphia, which had been refloated by her captors, was too great a prize to be allowed to remain in the hands of the Tripolitanians, so a decision was made to recapture or destroy her. The U.S. had captured the Tripolitanian ketch Mastico, renamed her Intrepid, and re-rigged the ship with short masts and triangular sails to look like a local ship. Her anchor was returned to the United States on April 7, 1871, when the Bashaw presented it to the captain of the visiting Guerriere. 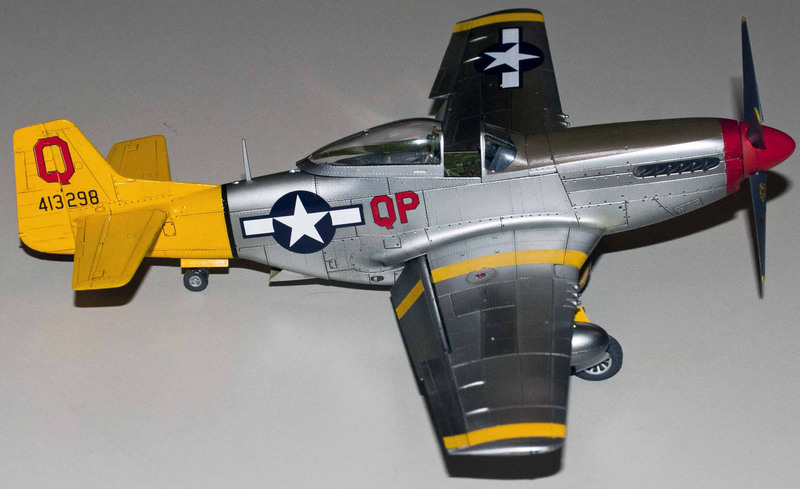 Since released in 1995, the Tamiya P-51D Mustang has been benchmark for 1/48 Mustangs kits. A simple and rewarding kit, it is not without its flaws and before talking about Meng’s effort I would like to revisit the Tamiya kit. 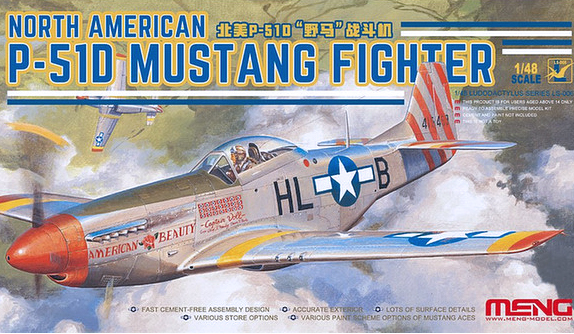 Tamiya’s Mustang has been released in five different boxes and has had one update to correct a flaw in the kit. 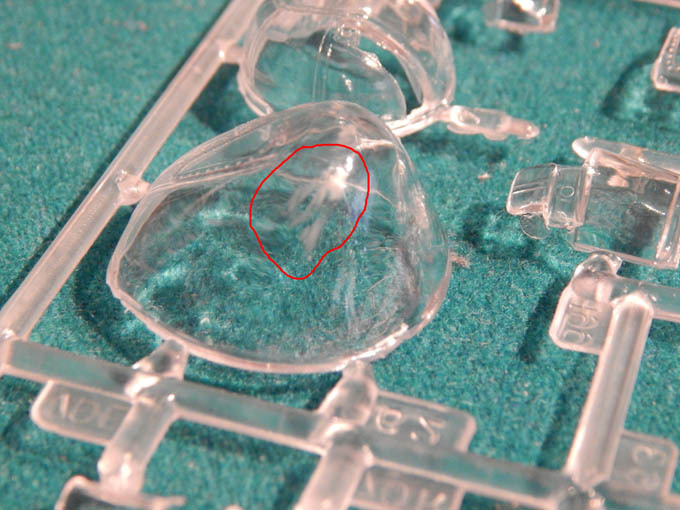 In the original release, Tamiya molded the sprue gates directly to the clear parts, the result being that clear could not be removed from the sprue without being marred. 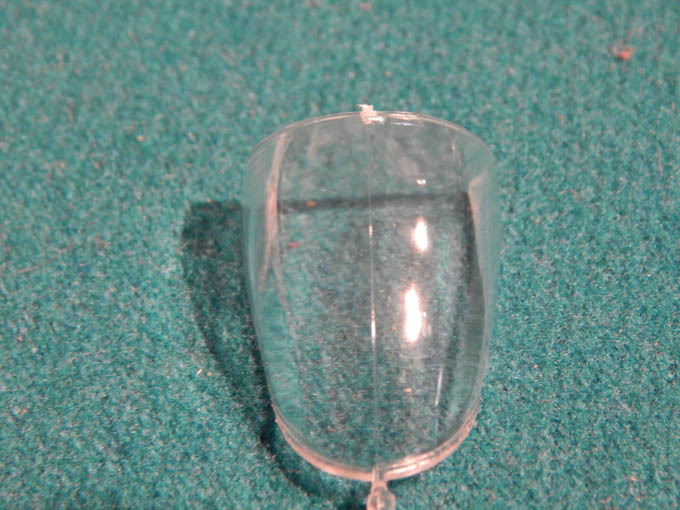 The subsequent revision moved the gate to the edge of the windscreen and the canopy but care must still be taken when removing the part that can be easily damaged. 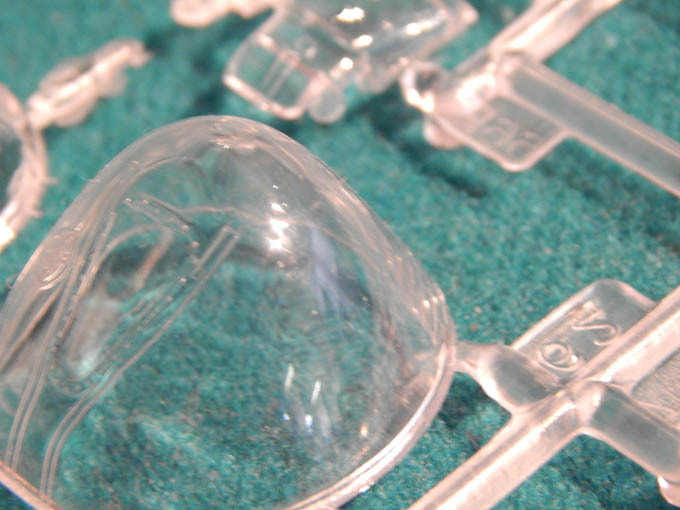 The main canopy is molded separately form the canopy frame and leaves a nasty seam if care is not taken in assembly. None of these problems is insurmountable and the kit remains a pleasure to build. Since released I have built five. 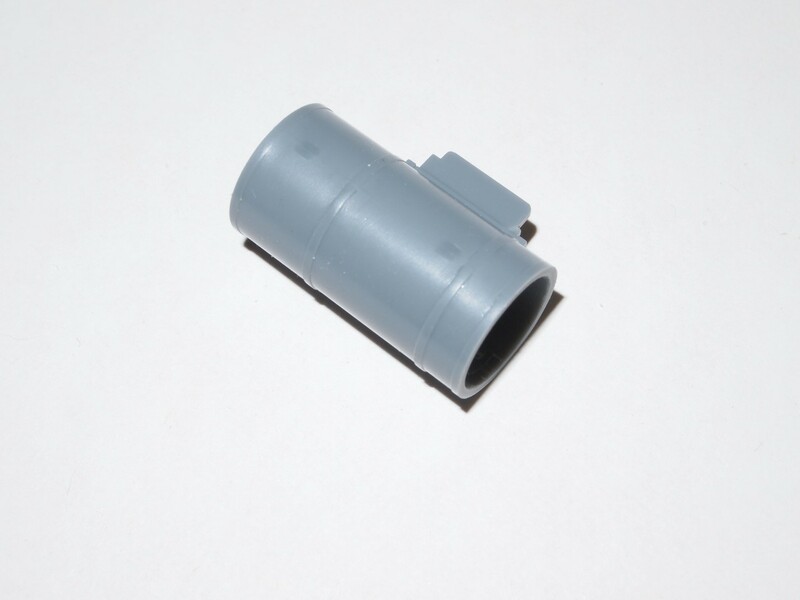 Meng’s kit is billed as being “Fast Cement-Free Assembly”. 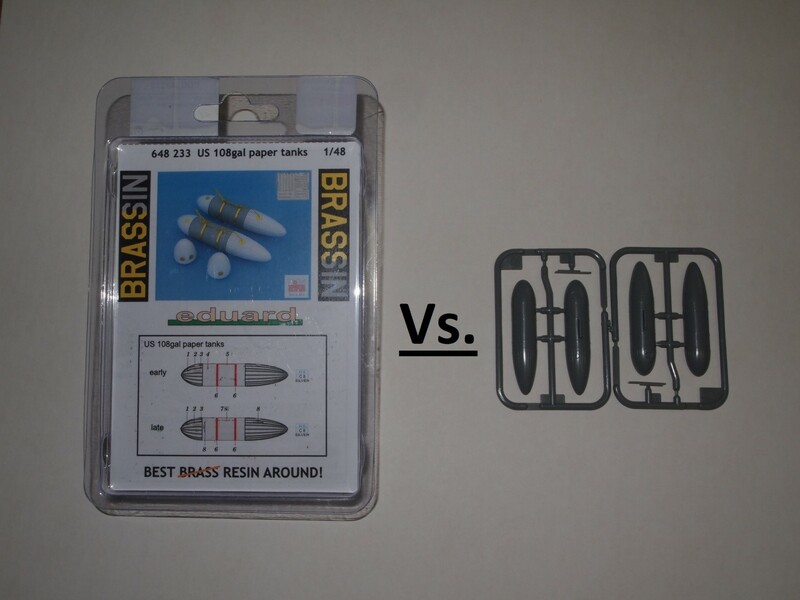 It contains well over a hundred parts as compared to the fifty plus parts in the Tamiya kit. 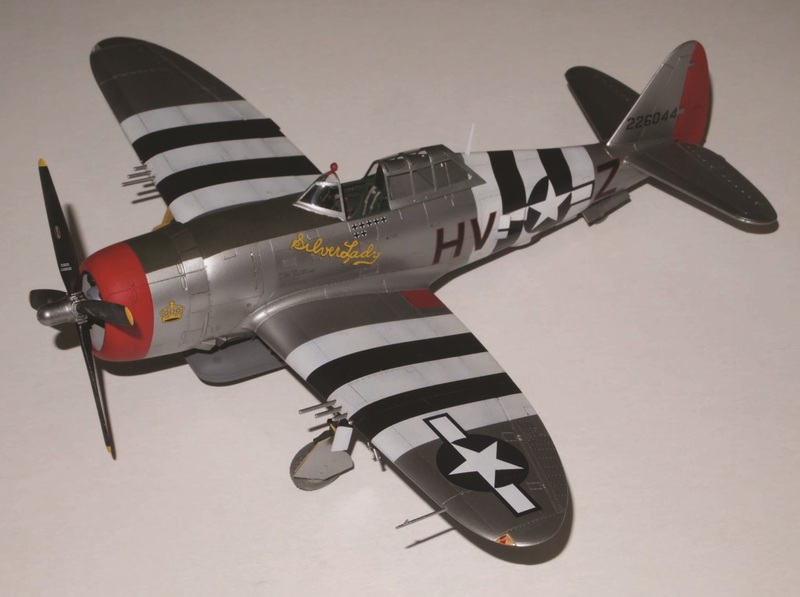 I had read Brett Green’s review on Hyperscale as well as his build in Military Illustrated Modeler. Several of his concerns in building his model carried over to my build and may have added unneeded complication to my build. First things first, you cannot build the model without glue, some parts would simply fall off and others would have unnecessarily large gaps. 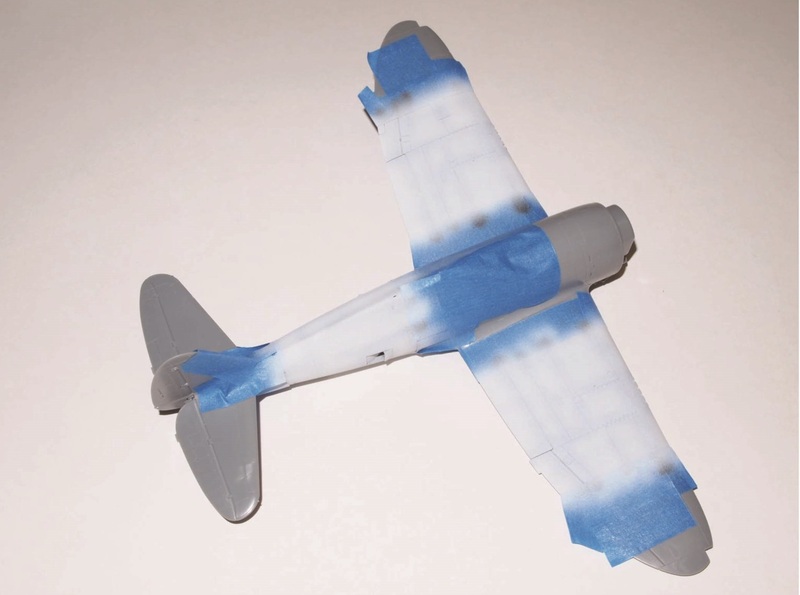 Green indicates in his build that the tail wheel must be added before the fuselage is assembled, subsequent reviews from other magazines do not mention this. He also states that if you modify the landing gear struts they can be installed after the wing has been assembled. 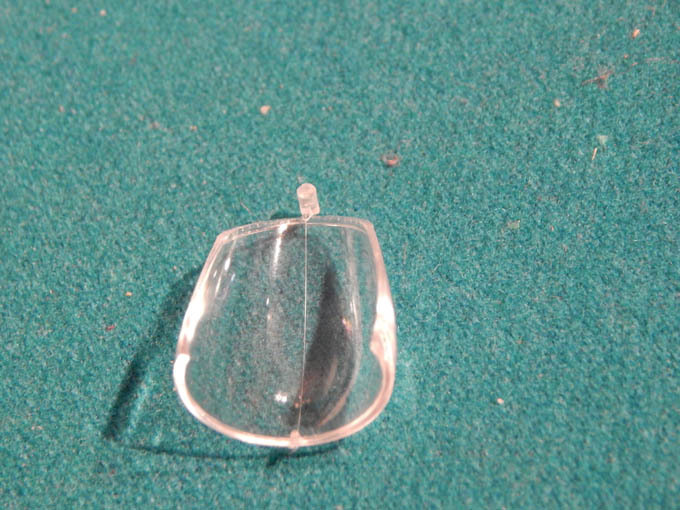 On my model I followed Green’s example and found the exposed tail wheel could be easily damaged. I also assembled the wing with the landing gear installed and this complicated my build. Subsequent reviews I have read do not mention adding the landing gear before assembling or there being any problem with adding them afterwards. 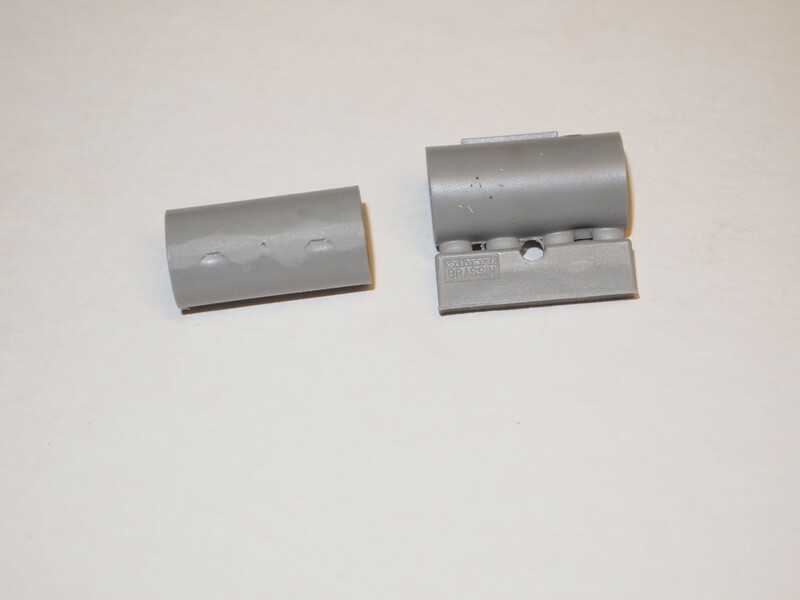 Inserts are provided for the machine guns in the leading edge of the wings. They do not fit well and require filling. I started my build with the interior and it is a marked improvement over the Tamiya kit’s interior. The only issue is the instrument panel decal that is rather crude. The instrument panel itself has only the outlines of the dials but no additional detail. One saving grace is that the panel is so deeply inset that it cannot easily be seen. This is also true of the Tamiya kit. Assembling the fuselage is quick with huge connectors but some force (I used pliers twice) is necessary to get the parts closed and in some areas the gaps required an application of Mister Surfacer. 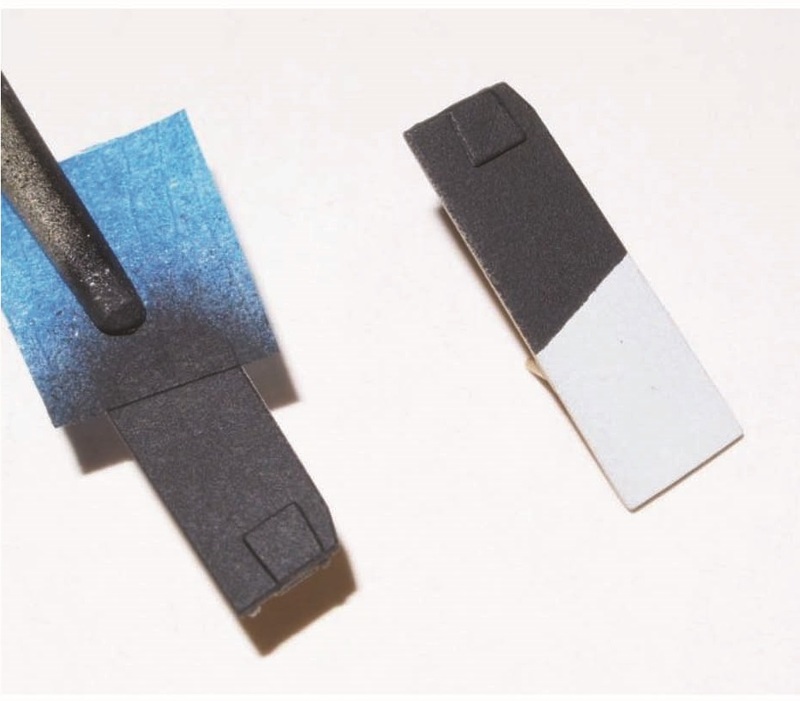 The vertical stabilizer must be glued together and clamped or it also has a considerable gap. 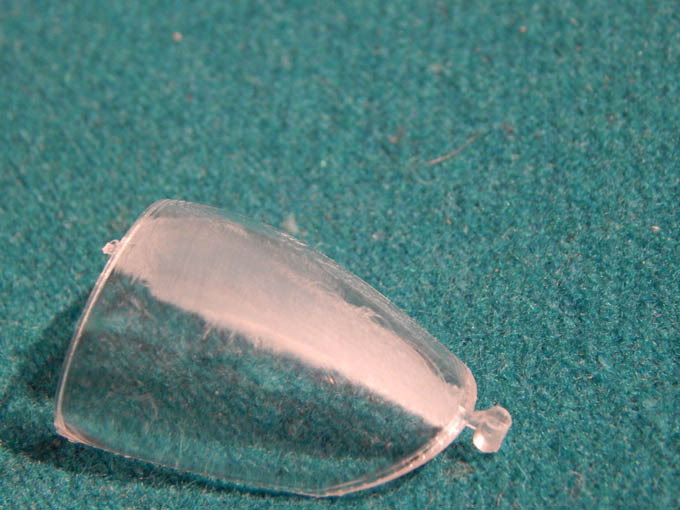 The curved upper fuselage piece requires that the antenna be added before it attached to the rest of the fuselage. 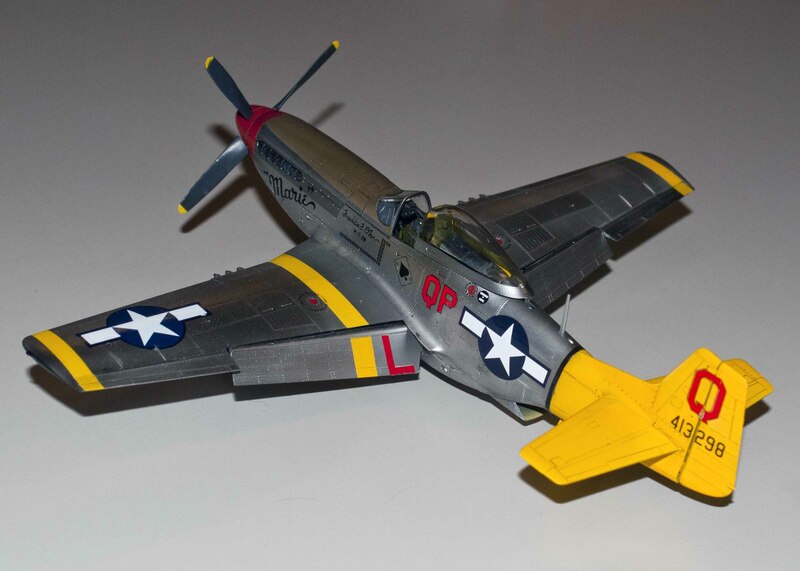 I stole an antenna from a junked Tamiya P-51 that I added after painting. 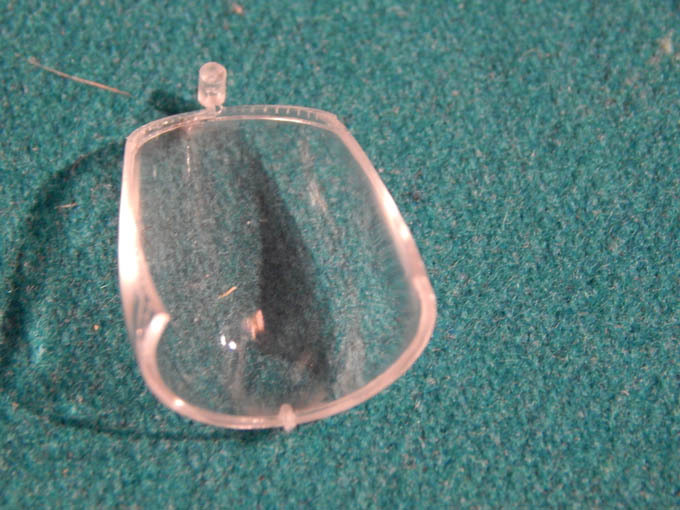 simple as I had hoped, the remaining pins were fragile and easily broken. I also question the angle of the dropped flaps as it is much steeper that the Tamiya kit. 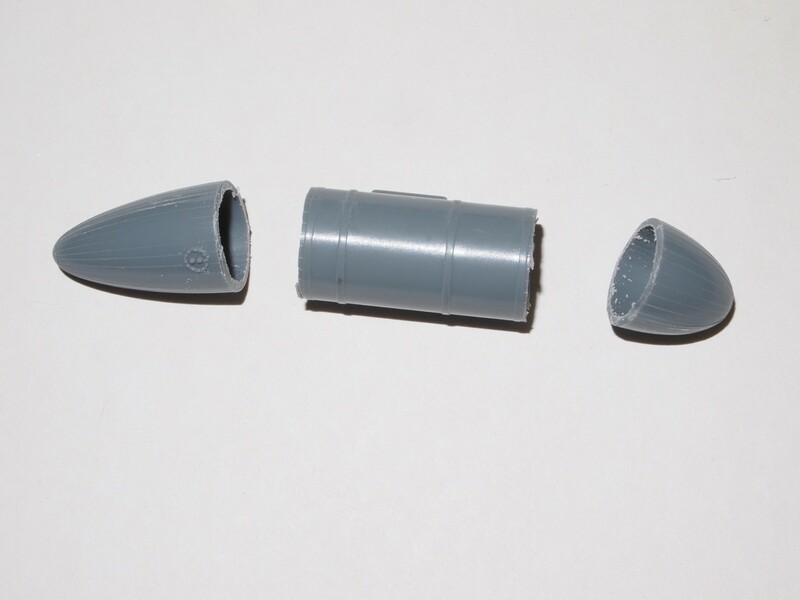 As mentioned earlier the machine gun inserts are an extremely poor fit and require careful filling. Like the Tamiya kit the wing panels are scribed and Meng adds counter-sunk rivet detail. 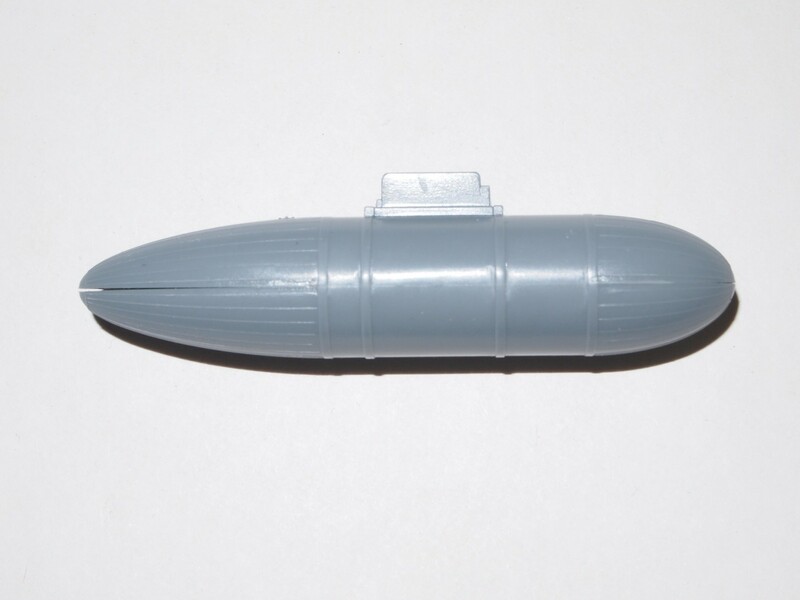 The kit does have some positive aspects; the drop tanks are designed so no sprue marks are visible and glue actually isn’t required for a good fit. 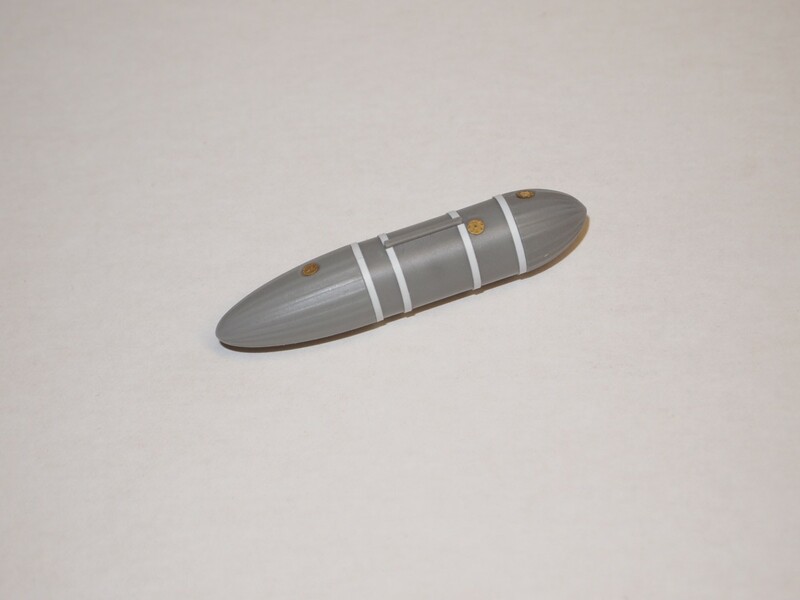 Meng offers cuffed Hamilton Standard and an uncuffed Aeroproduct’s propeller. These were easily assembled after painting and a vast improvement over Tamiya’s props. Both the original and the Dallas main canopies are included and require that the center-molding seam be sanded and polished out. 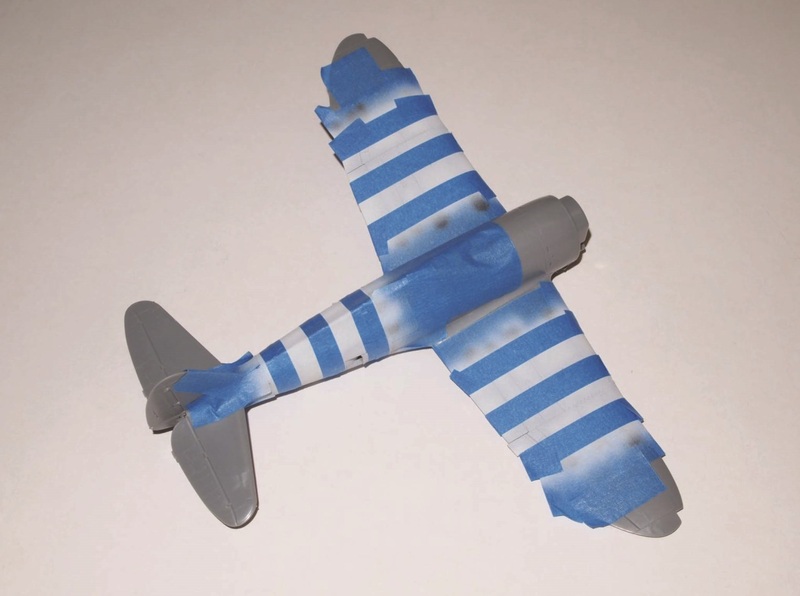 As of this writing there are no canopy masks for the Meng kit, but I found that Eduard’s mask for the Tamiya P-51D can used with a slight modification. The windscreen required minor trimming to fit properly. The kit provides a choice of two aircraft; a Fifteenth Air Force plane flown by Captain John Voll and a 9th Air Force bird flown by Captain Richard Turner. I elected to use Aeromaster sheet 48226 Ninth and Fifteenth Air Force Fighter Aces. 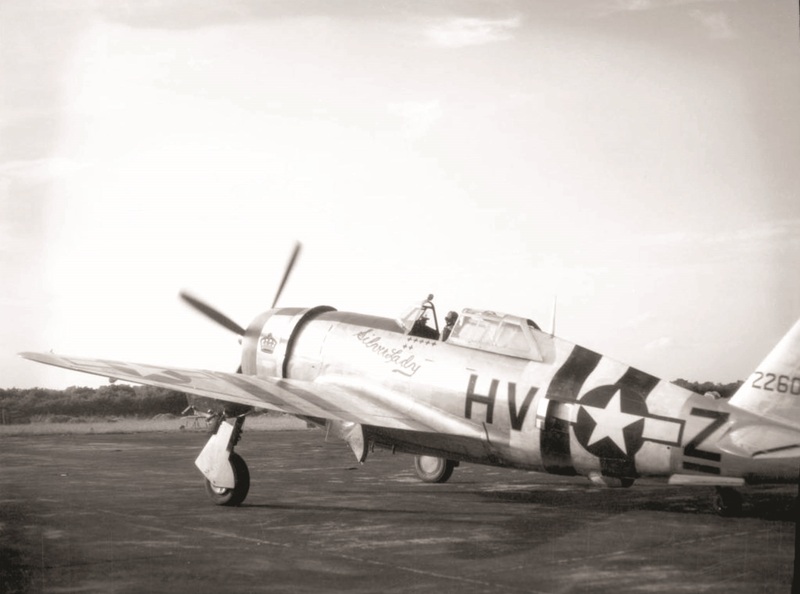 Captain Freddie Ohr, the only Korean American ace in World War II, flew the plane. 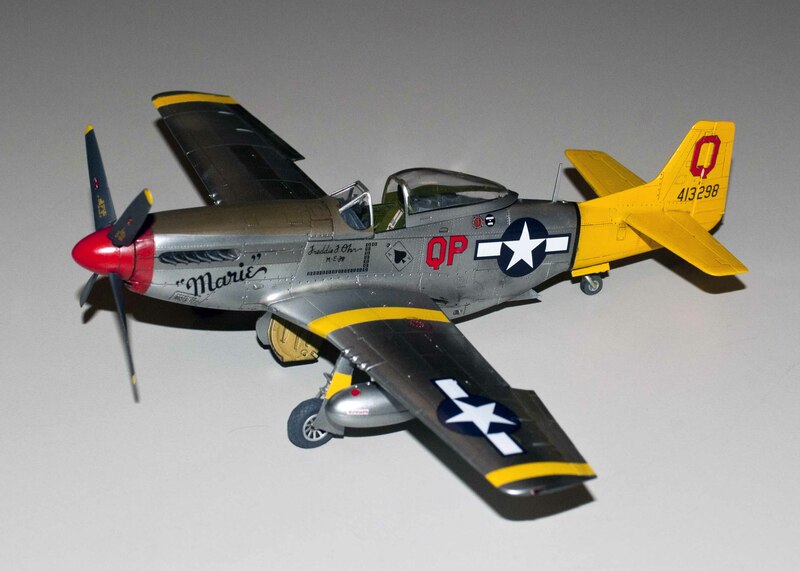 The model was undercoated with Tamiya Gloss Black and painted with Alclad Aluminum and White Aluminum Lacquers. 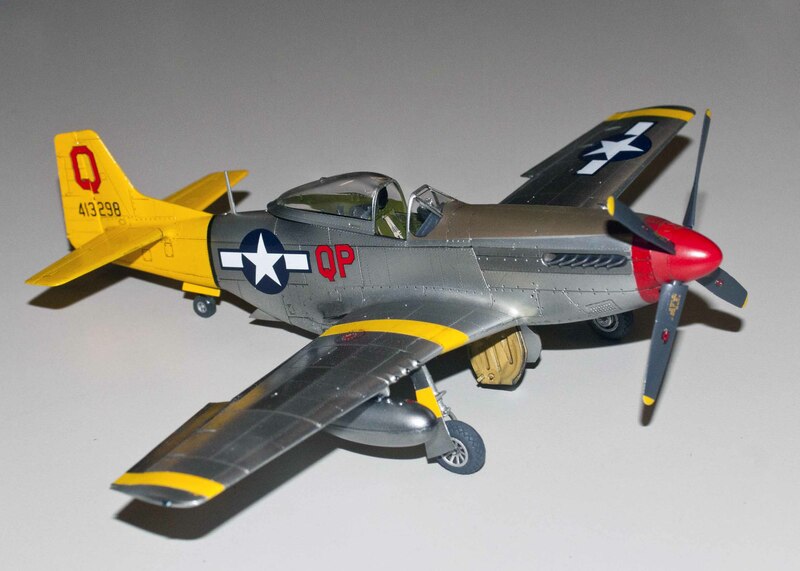 The yellow tail and stripes were Tamiya Flat Yellow and Tamiya Flat Red was used for the spinner and nose. I gave the finished model a wash with Flory water-soluble clay washes. The finished model looks very nice and I am still unclear as to whether the problems I had were self-inflicted rather than the kit’s fault. That being said, much of the engineering that went into making the kit “cement free” was wasted and a simple and more efficient build would have been possible if Meng had designed this as a conventional kit. In summary, the Meng kit does have some advantages and I have a second kit that I will be building soon. On the other hand, I’m not getting rid of my remaining Tamiya kits and of course Airfix and Eduard have new kits on the horizon. The Boeing 787 Dreamliner is an American long-haul, mid-size, wide body, twin engine jet airliner made by Boeing Commercial Airplanes. Its variants seat 242 to 335 passengers in typical three-class seating configurations. It is Boeing’s most fuel efficient airliner and is a pioneering airliner with the use of composite materials as the primary material in the construction of its airframe. The 787 was designed to be 20% more fuel efficient than the Boeing 767, which it was intended to replace. The 787 Dreamliner’s distinguishing features include mostly electrical flight systems, raked wingtips, and noise reducing chevrons on its engine nacelles. It shares a common type rating with the larger Boeing 777 to allow qualified pilots to operate both models, A total of 500 airplanes have been delivered, 324 -8’s and 176 -9’s to date. 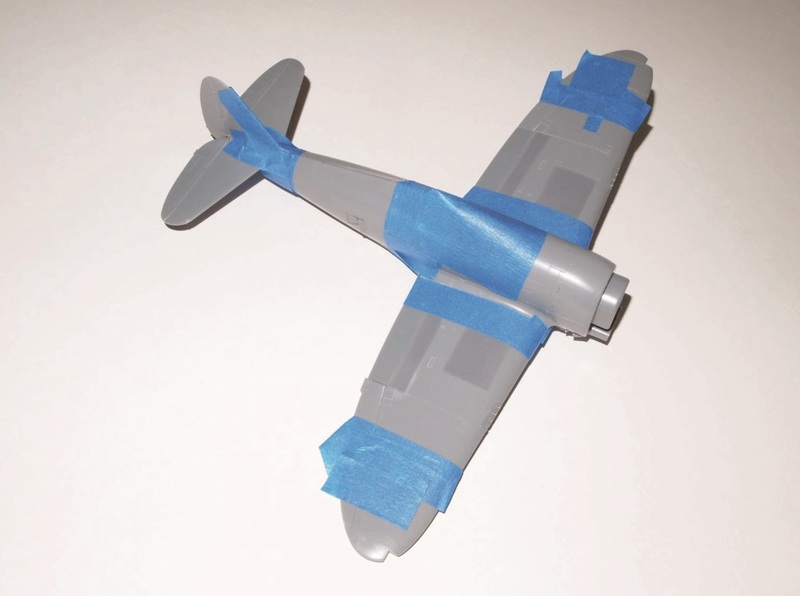 The kit was well packaged, one sprue of parts, 2 pieces for the fuselage, 2 pieces for the wings, a sprue of clear parts that contained the windows and the cockpit window. 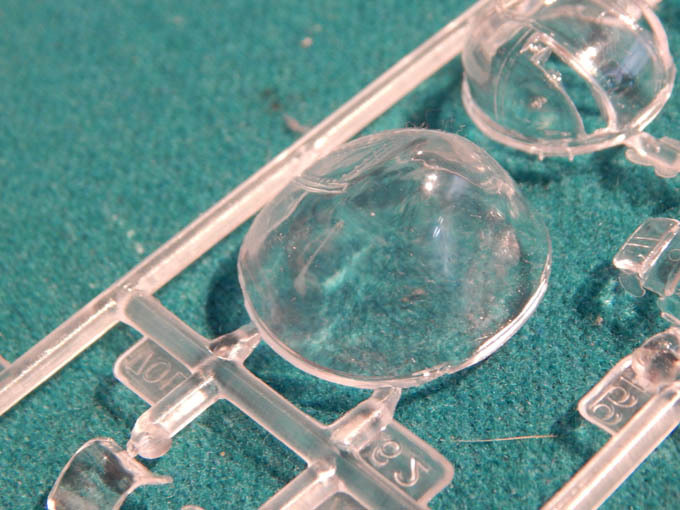 The first thing I did was wash the parts in a warm soapy water solution using a soft toothbrush gently as not to break off any of the small parts. The decal sheet that was included was for the Boeing Dreamliner initial rollout. They weren’t very colorful so I searched the internet for some other options. I found a decal sheet at F-DCAL in France for United and Continental markings. They included decals for the windows. Information on the decals and their placement will be made later in the review. 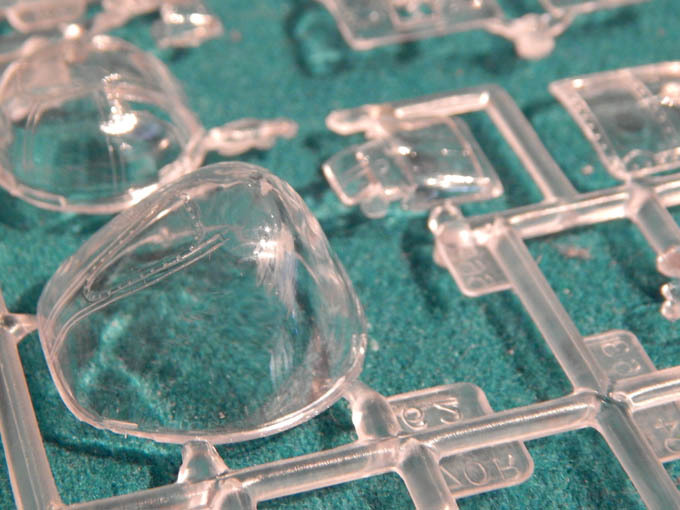 The first thing I did was glue in all the clear windows in both sides of the fuselages. I then applied a coat of Tamiya gray primer to all the parts. This was a big model I added some lead to nose of the plane after I had glued the nose wheel box in place. The windows protruded somewhat from the fuselage, since there were decals for the windows, I sanded them smooth with the fuselage. After this was done, the halves were glued together and set aside to dry. The fuselage was then given another coat of gray primer. I then proceeded to paint and assemble the engines. They were quite detailed, included double fan blades and a detailed exhaust nozzle. These assemblies were then put aside to be added later in the build. The wings were then assembled; the lower wing was one piece and two pieces for the upper wing. After the wing dried, I did a dry fit with fuselage and it looked like I wouldn’t have to glue them together. 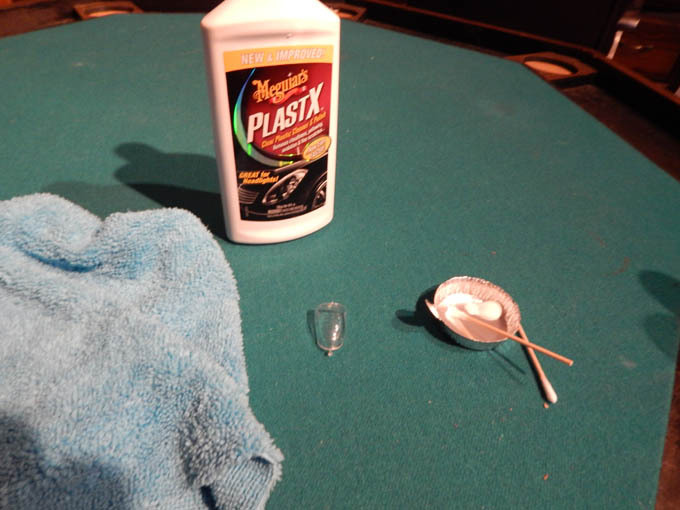 That eliminated any filling and sanding going forward. 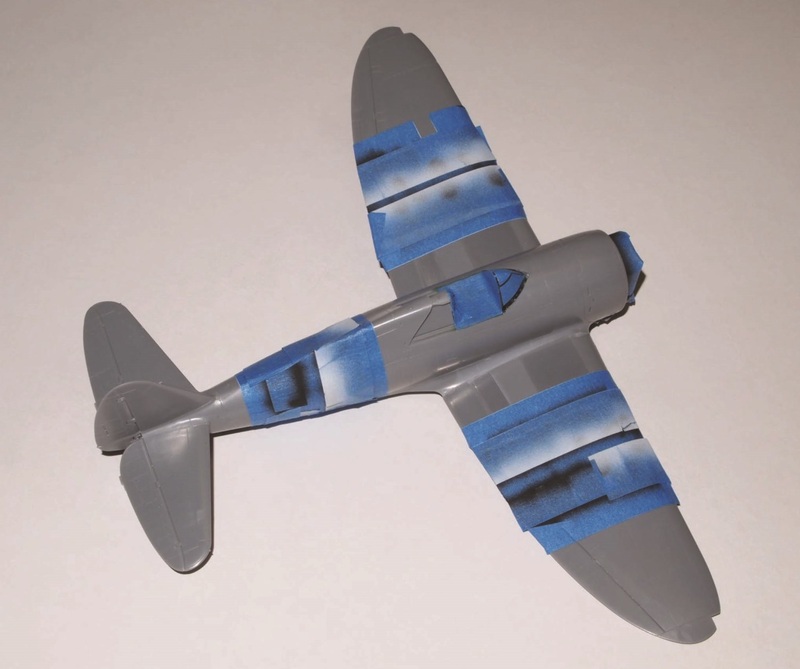 The paint scheme was Gloss White on the upper fuselage and Light Ghost Grey (MM Acryl FS36375) on the lower body. 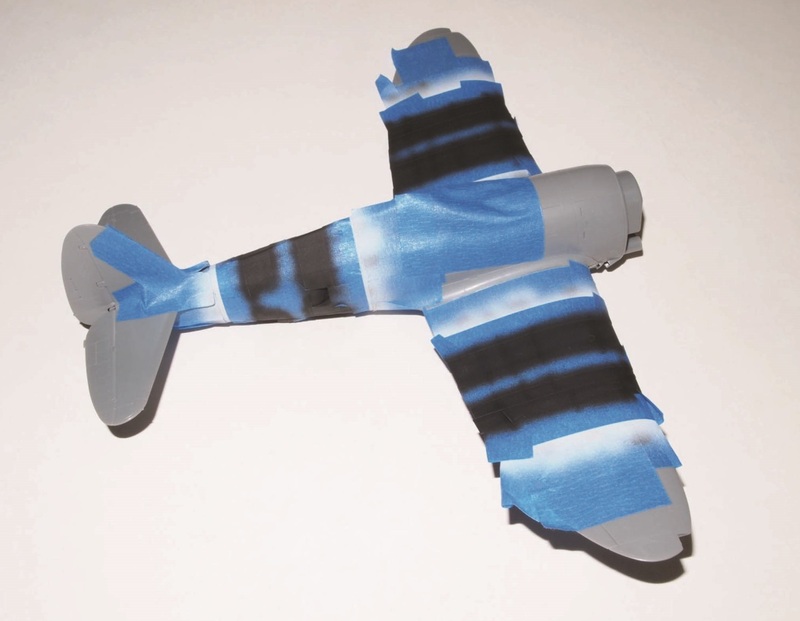 The wings and fuselage were painted separately. The fuselage for the United Airline scheme had a wavy scheme from front to back. So I made copies of the decals and cut out the gold scheme decals and used them as a template for painting the lower fuselage. I cut out the copies and laid them on some Tamiya 18mm tape and traced them out. I trimmed them out with a brand new No. 11 blade. These pieces were placed just below were the gold decal stripes would be as the curvature is the same. 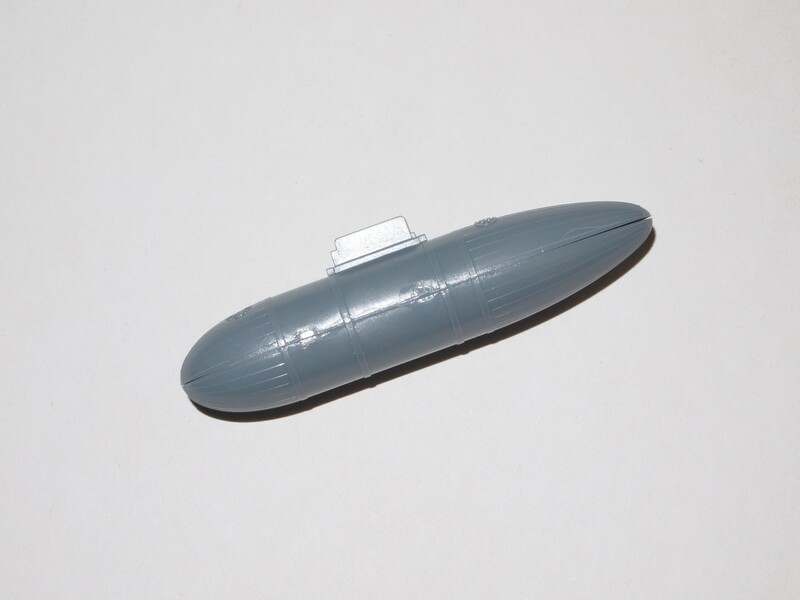 I then added a little more tape and proceeded to paint the lower fuselage Light Grey (MM Acryl). I gave it two/three coats to make sure I had good coverage. I them made more copies of the wavy scheme and applied them to the lower fuselage just lining them up with the grey that was just painted. Next was to apply several coats of Gloss White (MM Acryl FS17875). This process was done over several days. After applying the last coat of Gloss White, I removed all the Tamiya tape and misc. 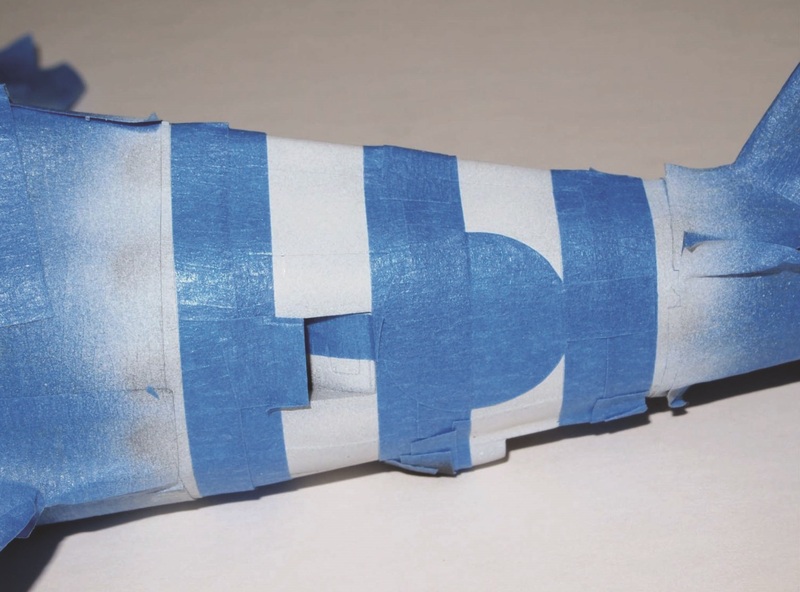 paper coverage from the lower fuselage. The next thing I did was to paint the wings. 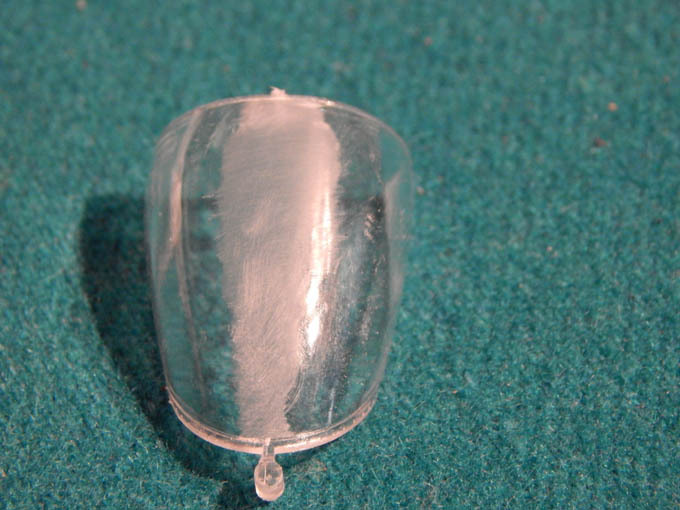 I started with the Gloss White and applied several coats to insure good coverage. The lower part of the wing was painted Light Ghost Grey with several coats. 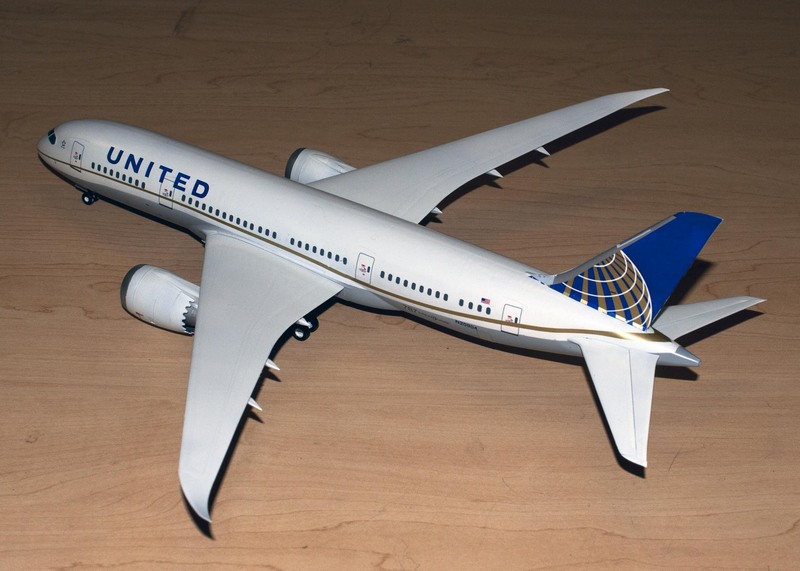 After looking on the internet at many pictures of the Dreamliner, there was no definitive scheme for the leading edges of the wings. Some pictures showed an aluminum/silver leading edge, other were just white. Even in pictures of the liveries of different airlines, there was no consistence in the color of the leading edges. The next step was to add the decals that I purchased from F-DCAL. I started with the door decals as the gold stripe decals would be going over some of the doors in the process. I added the decals and let them sit for a couple of hours before proceeding to add the window decals. These decals were added in segments since it would be easier to position smaller pieces, rather than use a long strip of windows. I let the plane sit for a day before adding the gold stripe along each side of the fuselage. These were also cut into manageable strips to aid in the positioning of the decals. 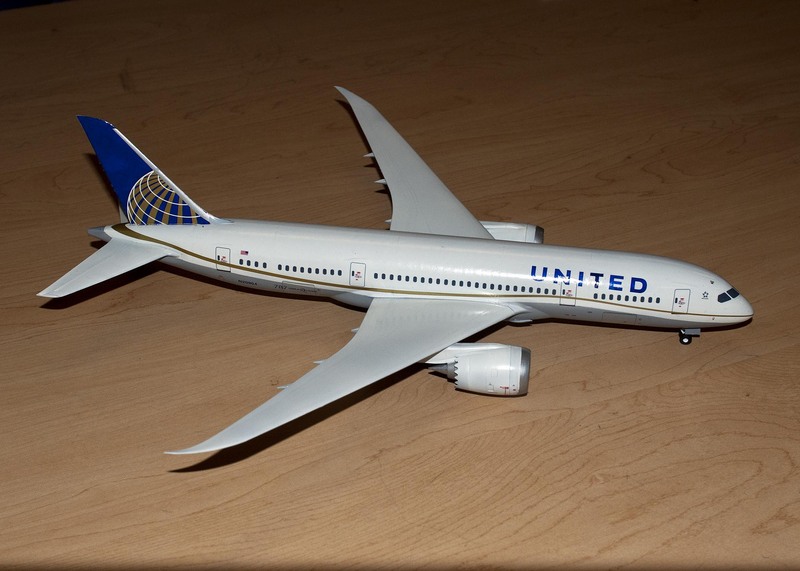 The next day I added the United decals and any smaller decals, like aircraft number, the name Dreamliner, and any other small details. The decals came off the backing if you just looked at them; it took no more than about 20 seconds for them to come loose. The only decals that seemed out of the ordinary were the ones for the cargo doors on the right side and one decal on the left side. After applying them they were very glossy. The engines by themselves took a long time to apply as there were about 12 pieces for each engine. There was also one spinner decal for the inside of each engine. The cockpit window decal was one piece and it lay down very nicely. 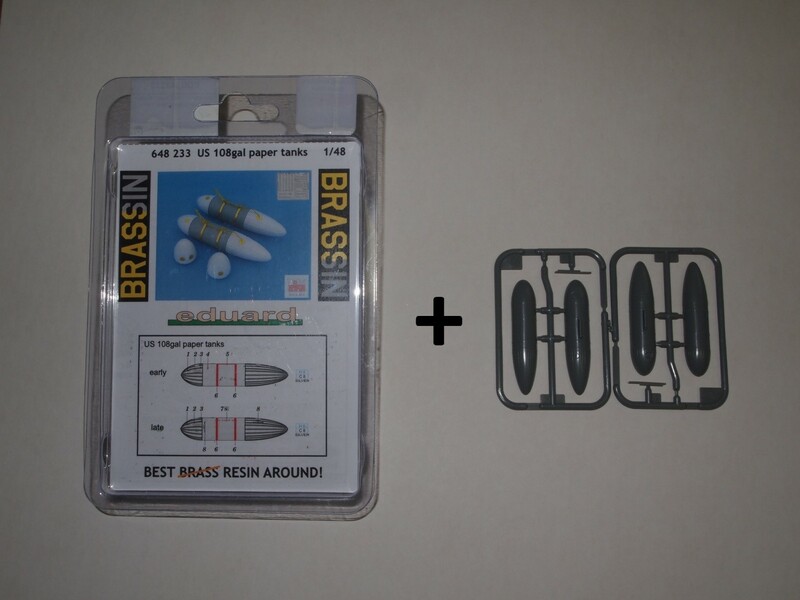 For the landing gear I opted to use metal parts from Scale Aircraft Conversion which I ordered from Sprue Brothers. 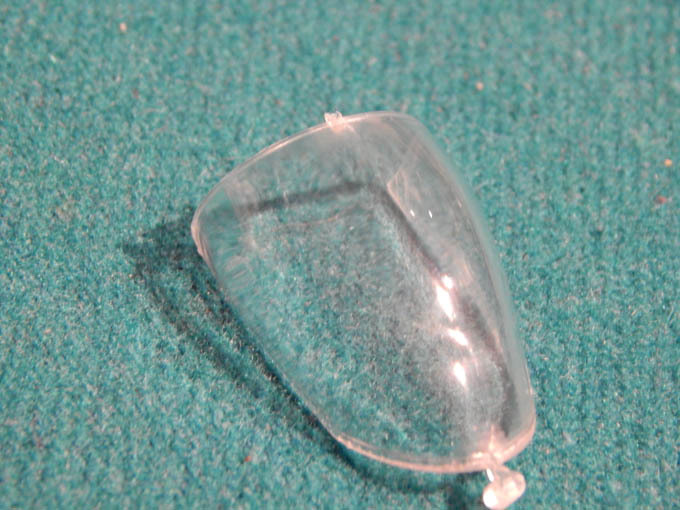 The cast metal parts are very delicate and are prone to be bent easily. Replacing the plastic landing gears was an easy decision based on the size of the model. The cast metal parts took a little bit of cleaning up with some small files. Once the parts were cleaned up I did a dry fit to make sure that I had all the glue points determined. I used super glue for these parts. The main landing gear was glued in first and then followed with the 2 smaller parts for each. The four wheel bogies were assembled individually and applied to the main gear assemblies. This process almost insures that they all sit squarely on the ground. The front wheels were then added next. I then attached the wing assembly and it fir great without any glue. This was an enjoyable build, the Zveda kit was great as all the parts fit well. 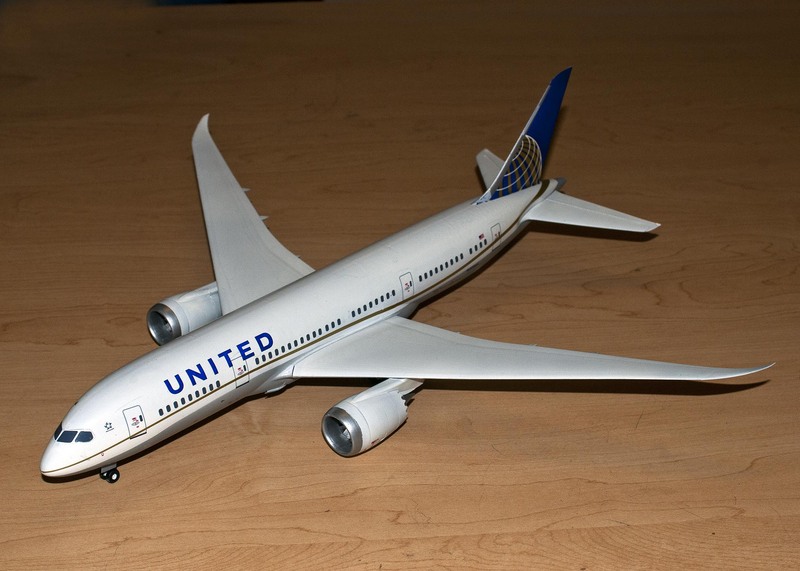 My next build will probably be a United 727, 720 or 747. 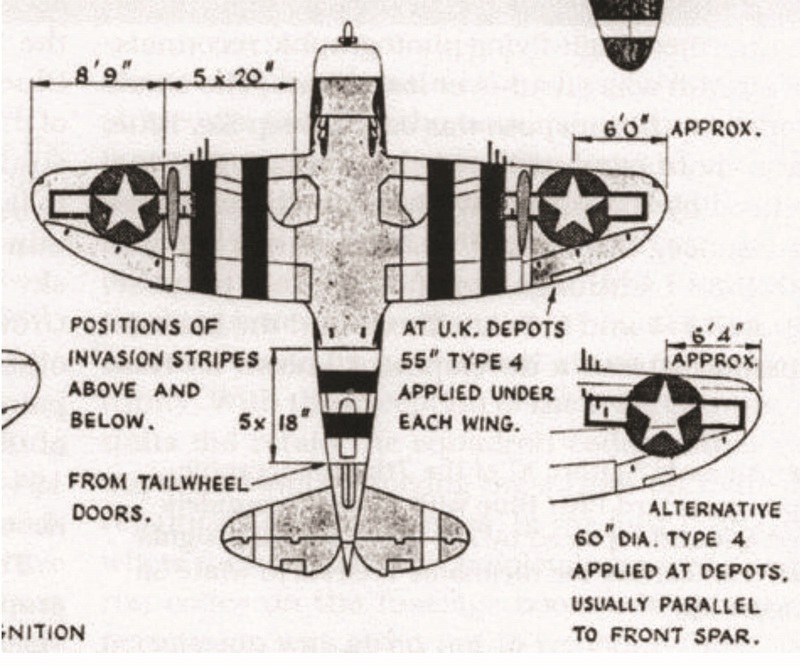 The problem is trying to find the decals for these particular planes. 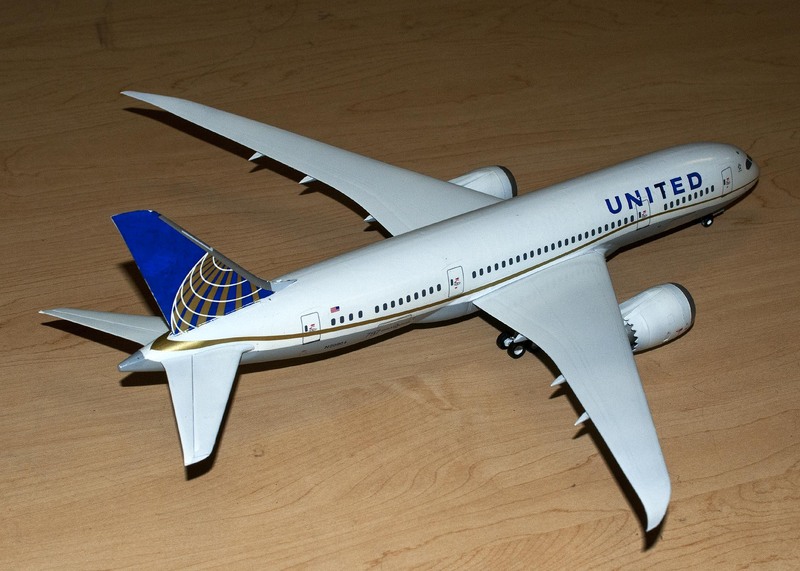 I plan to use the United Airline aircraft at the next club exhibit at the Butch O’Hare show next November.